You can add a status to each budget document. There are three statuses such as open, approved and rejected in the InLoox PM Web App by default. For more information about budget status, see Create and edit a budget. 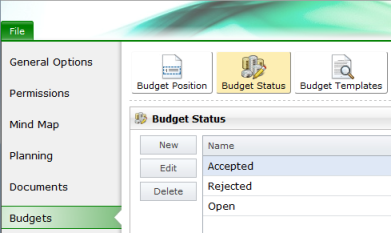 In the InLoox PM options you can change the budget statuses and add a new one. Add a new budget status by clicking New. In the Budget Status dialog box, in the New Name filed type a new name. Select the Budget neutral control box, if you don't want to include the budget to the totals in the budget overview. Remove the status from InLoox PM Web App by clicking Delete. The renaming of a status takes immediate effect in all relevant projects. On the deletion of a status the relevant budgets have no status until a user selects a new one in the project, on the budget page over the New Budget / Edit budget dialog box. How to edit the budget status in InLoox PM 7 Web App • Copyright 1999-2019 © InLoox GmbH. Tous droits réservés.